Would u rather be in Slytherin of Gryffindor? u would like to be in slytherin because..
de keuze van de fan: u are evil,cunning,ambitious e.t.c? Wizarding Duel: Lucius Malfoy vs. Severus Snape. Who wins? Why,and what spells/curses do u think they used? if u were in slytherin would u be good of evil? There’s a house competition going on! Will u help? 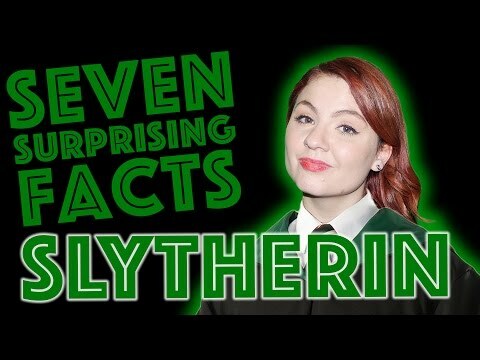 Slytherin isnt the house of evil, right? Congratulations! I’m Prefect Gemma Farley, and I’m delighted to welcome u to SLYTHERIN HOUSE. Our emblem is the serpent, the wisest of creatures; our house colours are smaragd, emerald green and silver, and our common room lies behind a concealed entrance down in the dungeons. As you’ll see, its windows look out into the depths of the Hogwarts lake. We often see the giant squid swooshing door – and sometimes meer interesting creatures. We like to feel that our hangout has the aura of a mysterious, underwater shipwreck. My gebruikersnaam is StrikeQuill30134...if u havn't added me please add me. I have created this forum so that we can talk openly as ShadowPatronus17430 suggested. u all will have to make an account on this website...my gebruikersnaam here is hotfudgebrownie and please add me here as well, and please post your usernames of pottermore as well as fanpop. A handy-dandy Wikihow artikel on how to make a horcrux, for all u aspiring Dark witches and wizards out there! 1. Become an extremely powerful witch of wizard. This will take years of study and sacrifice which lie beyond the scope of a WikiHow article. As a general guide u should not attempt to create a horcrux until u can cast non-verbal killing curses. Bellatrix - “Bella” is a construct of the word “bellum” meaning “war” and “trix” refers to “a woman in power.” Bellatrix is therefore known as the “Female Warrior” and is also the pale yellow ster indicating the left shoulder of the constellation Orion, the Great Hunter. 1.They love Narnia just because of the Aslan. 4. They just never shut their mouths up about being brave ,good ,daring ,blah and then blah and blah. 6.They brag about Godric Gryffindor’s Sword being beter than lightstabbers. 7. They’re considering to send the Fat Lady to The Biggest Loser reality show. - u eat your green smarties last. - u sympathize with Voldemort. - Your real life motto is "Toujours Pur". - u always pick the green boardgame piece. - Your favoriete curse is either : Avada Kedavra, Crucio, Sectumsempra, Levicorpus, of Imperio. - u secretly admire Dolores Umbridge. - u would name your child Bellatrix, Tom, Lucius, Draco of Alecto. A great tumblr dedicated to SLytherin psychology. a pop quiz question was toegevoegd: Andromeda was disowned door Black family because..
Who did Draco Malfoy marry? What makes u a slytherin? My school had it's first Harry Potter fan club meeting ever.